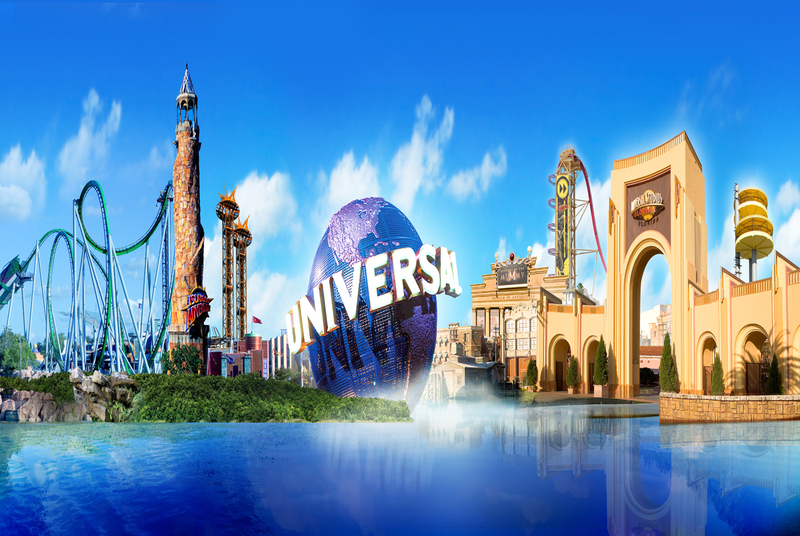 Universal Studios Florida is composed of themed areas and attractions based on the film industry. Visitors get themed dining and shopping, a variety of special events throughout the year, and may even catch an actual film crew at work on the backlot. The original theme park in the resort, Universal Studios Florida opened on June 7, 1990, as a theme park that lets visitors “Ride the Movies.” The themes of Universal Studio’s are targeted at making guests feel like they are in a movie set with rides, shows, and attractions inspired by popular film, television, and music productions. The park consists of eight themed areas – Hollywood, Production Central, New York, San Francisco, Diagon Alley/London, World Expo, Springfield, and Woody Woodpecker’s Kidzone. Universal’s Islands of Adventure, opened in May 1999, is a theme park composed of seven distinct “islands” that are themed to various forms of adventures. Visitors start off in the Port of Entry and make their way through the various islands – Marvel Super Hero Island, Toon Lagoon, Jurassic Park, The Wizarding World of Harry Potter, The Lost Continent, and Seuss Landing. The Wizarding World of Harry Potter, based on the popular Harry Potter franchise, is the only island added after the park opened; it opened to the public on June 18, 2010. Universal CityWalk Orlando opened in 1999, over the former parking lot and entrance, as part of the expansion that created the Universal Orlando Resort. Guests arriving at the resort park in one of two multi-story parking structures, then travel via covered moving sidewalks over Universal Boulevard into CityWalk. From there, guests can proceed into either of the theme parks, Universal Studios Florida or Islands of Adventure. The Universal Store offers merchandise from both parks. CityWalk features shopping, nightclubs, dining venues, an AMC Movie Theater, and a Blue Man Group show. There are many night clubs at CityWalk including Groove, CityWalks’s Rising Star (a karaoke club with a live band), Red Coconut Club, and Bob Marley-A Tribute to Freedom (both a night club and restaurant). Some notable locations are The Cowfish Hard Rock Cafe, Jimmy Buffett’s Margaritaville, Emeril’s, NBA City, and Bubba Gump Shrimp Company. Casual dining places include: Moe’s Southwest Grill, Burger King Whopper Bar, Panda Express, Red Oven Pizza Bakery, and Fusion Bistro Sushi & Sake Bar. Wet ‘n Wild was founded in 1977 by SeaWorld founder George Millay as one of the first major water parks. In 1998, Wet ‘n Wild was acquired by Universal Parks & Resorts, adding it to Universal Orlando. There are eighteen water slides and attractions at the water park. Popular attractions include The Storm, Bomb Bay, Disco H20, and The Surge. Wet ‘n Wild is located at the intersection of International Drive and Universal Boulevard, about half a mile south of the Universal Orlando parking garage. Wet ‘n Wild will close on December 31, 2016, to be replaced by Volcano Bay. Volcano Bay is to be Universal Orlando’s on-site water park when it opens in 2017 on 53 acres (21 ha) of land near the Cabana Bay Beach Resort.